This is a quick project. 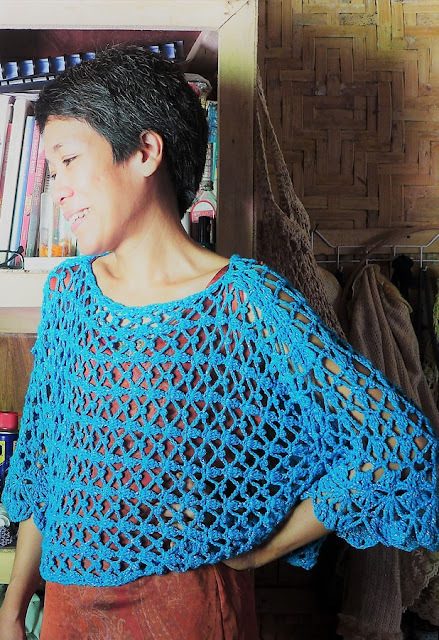 Choose nice stretchy, woolly, warm yarns for this project. Get nice colours, Multi-colour yarns can come out nice with this pattern. 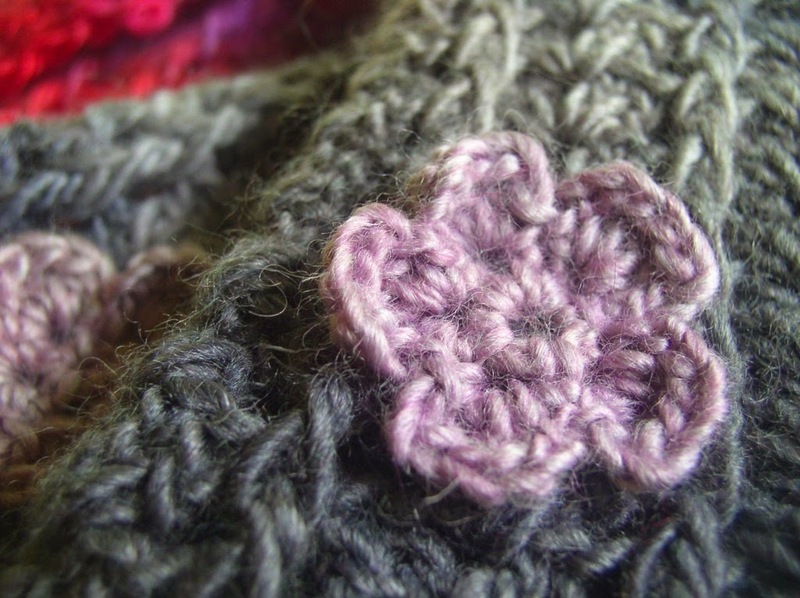 A crochet flower is sewn onto the mitts. 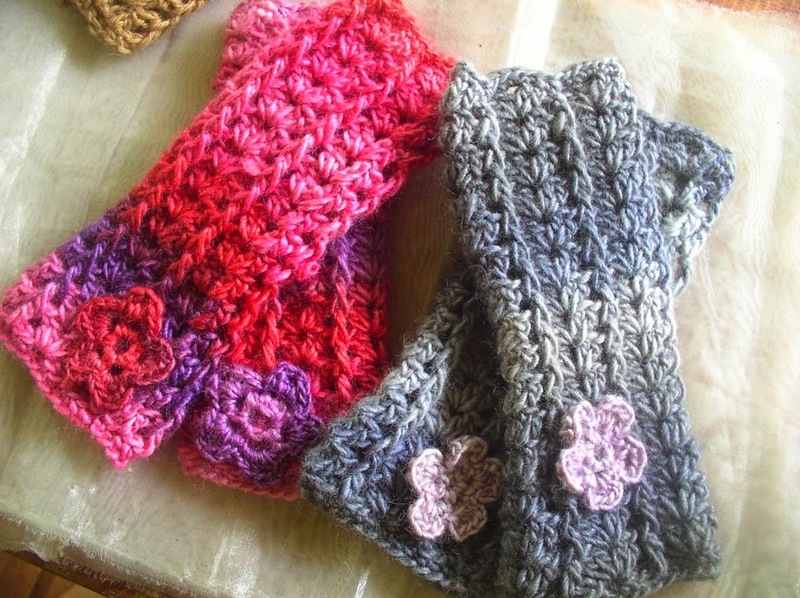 Try using other crochet motifs. Add beads, buttons, feathers, pompoms, etc. Play around with the pattern. Feel free to use this pattern to make finished items to sell in your shop! Lotus Yarns Sunset or any of your favourites. Preferably winter yarn in worsted weight or larger. Choose a suitable hook for your yarn. For Lotus Yarns Sunset I used a 3.5mm hook. Front Post Double Crochet (FPdc): Yo and insert hook from the front to the back around the post of the dc on the previous row. Complete as for regular dc. 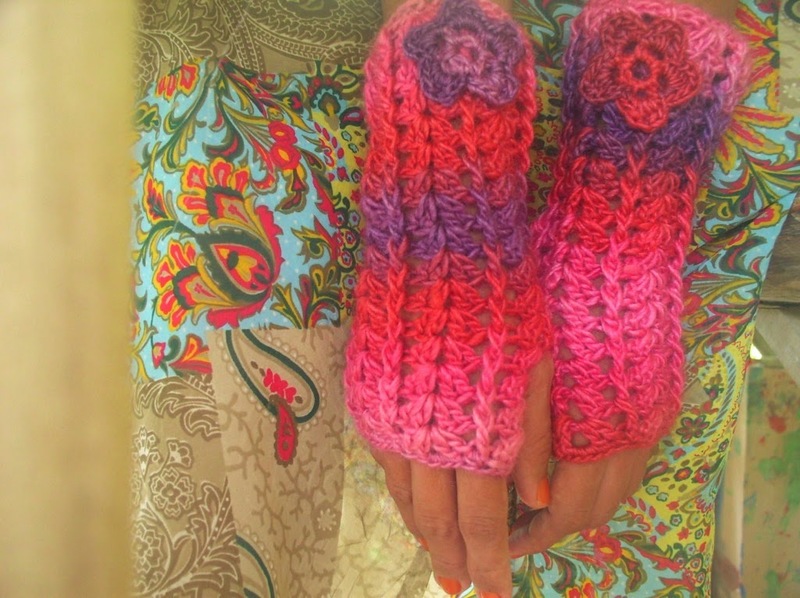 Ch a multiple of 12 stitches the length to fit around your hand. Standard size is 6” to 7”. Sl st in first ch to join. Rnd 1: Ch 1, sc in each ch. Sl st in first ch to join. Rnd 2: Ch 4 (count as dc, ch 1); 2 dc in first sc, *sk next 2 sc, dc in next sc; sk 2 sc; (2 dc, ch 1, 2 dc) in next sc; rep fr * all around. End with sk next 2 sc, dc in next sc; sk last 2 sc, dc in first sc, sl st in first dc to join. Sl st in ch sp. Rnd 3 – 8: Ch 4 (count as dc, ch 1); 2 dc in same ch sp; *Fpdc in next dc; (2 dc, ch 1, 2 dc) in next ch sp; rep fr * all around. End with Fpdc in last dc; dc in first ch sp, sl st in first dc to join. Sl st in ch sp. Rnd 9: Ch 3 (count as dc); 2 dc in same ch sp; *Fpdc in next dc; 4 dc in next ch sp; rep fr * all around. End with Fpdc in last dc; dc in first ch sp, sl st in first dc to join. Sl st in sp after the first dc. Rnd 10 – 12: Ch 3 (count as dc); 2 dc in same sp; *Fpdc in next dc; 4 dc in sp after 2 dc; rep fr * all around. End with Fpdc in last dc; dc in first sp, sl st in first dc to join. Sl st in sp after the first dc. Rnd 13: Ch 4 (count as dc, ch 1); 2 dc in same sp; *Fpdc in next dc; (2 dc, ch 1, 2 dc) in next sp after 2 dc; rep fr * all around. End with Fpdc in last dc; dc in first sp, sl st in first dc to join. Sl st in ch sp. Rnd 14: Ch 4 (count as dc, ch 1); 2 dc in same sp; *Fpdc in next dc; (2 dc, ch 1, 2 dc) in next ch sp; rep fr * all around, ending with Fpdc and leaving the last 4-dc group unworked. In last ch sp make 3 dc, ch 2 or 3 or more to make a gap that will fit the thumb; Fpdc in last dc; dc in first ch sp, sl st in first dc to join. Sl st in ch sp. Rnd 15: Ch 4 (count as dc, ch 1); 2 dc in same ch sp; *Fpdc in next dc; (2 dc, ch 1, 2 dc) in next ch sp; rep fr * all around, ending with Fpdc and leaving the 3-dc at thumb unworked. In last of the 3-dc make (dc, ch 1, dc); Fpdc in last dc; dc in first ch sp, sl st in first dc to join. Sl st in ch sp. Rnd 16: Ch 4 (count as dc, ch 1); 2 dc in same ch sp; *Fpdc in next dc; (2 dc, ch 1, 2 dc) in next ch sp; rep fr * all around. End with Fpdc in last dc; dc in first ch sp, sl st in first dc to join. Sl st in ch sp. Rnd 17: Ch 1, sc in each st and ch sp across. Sl st in first sc to join. Fasten off. Ch 5, sl st in first ch to form ring. Rnd 1: (Ch 4, *yo twice, insert hook in ring and draw up loop, [yo and draw through 2 loops on hook] two times, rep from *; yo and draw through all loops on hook, ch 4, sl st in ring) 5 times. Fasten off. Sew flowers to wrist warmers as shown in photograph. Weave in all ends. This copies over with a black background therefore taking up a lot of ink. Don't know how to do it otherwise.